KML-010 is a drug derived from spiperone. 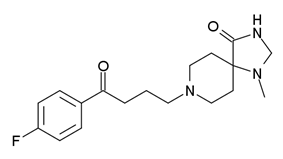 It functions as a highly selective 5-HT2A receptor antagonist, with negligible affinity for the 5-HT1A or 5-HT2C receptors, and over 400-fold lower affinity for the D2 receptor in comparison to spiperone. ^ Glennon RA, Metwally K, Dukat M, Ismaiel AM, De los Angeles J, Herndon J, Teitler M, Khorana N (June 2002). "Ketanserin and spiperone as templates for novel serotonin 5-HT(2A) antagonists". Current Topics in Medicinal Chemistry 2 (6): 539–58.